The Netherlands strive to develop their agricultural sectors and businesses rapidly. Developments in the past were aiming to improve efficiency. The current focus is on sustainability and circularity in particular. We only have one planet and an increasing number of people to feed. So we are challenged to reduce the impact of food production on the environment, improve animal health and welfare and develop successful new product market combinations. 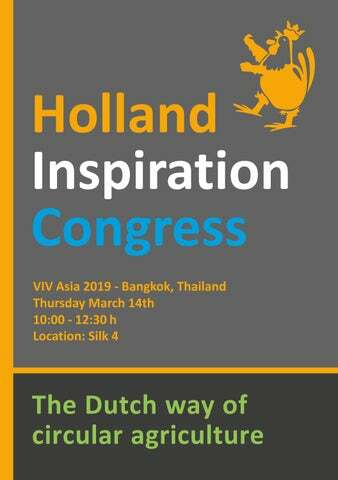 The Dutch Government, farmers and supply chain partners are proud to tell you all about this transition at the Dutch Inspiration Congress at VIV Asia! This booklet gives you a highlight of the programm and introduction of the speakers. As moderator of this conference I hope to see you on March the 14th. THE SHIFT TO CIRCULAR AGRICULTURE: BALANCING FOOD PRODUCTION AND NATURE AND THE PRINCIPLES OF SUSTAINABILITY Agriculture, horticulture and fisheries make a major contribution to prosperity in the Netherlands. These sectors are characterised by ongoing innovation, high efficiency and low production costs. The Netherlands enjoys global renown as the world’s second-largest exporter of agricultural products. Yet we can see that agriculture is economically vulnerable, in the Netherlands and elsewhere. Increases in scale and reductions in cost are not resulting in higher incomes for farmers. Farming is also putting pressure on the environment. Our planet can no longer sustain the burden of current production methods and consumer behaviour. Climate change is substantially magnifying the challenges facing the agrarian sector. Food production needs to be founded on different principles. Agriculture will have to make a transition from a model based on continual cost price reduction to one based on continual reductions in the use of raw materials. We must put an end to the wastage that now exists at various links in the food chain, from primary production to rubbish bins in kitchens. Healthy soil and the balance with nature are also central to circular agriculture. Agriculture in harmony with the environment and based on natural cycles will require encouraging farmers, entrepreneurs and researchers to share their knowledge and experience, not only in the Netherlands but also internationally. Markets are international, and circular systems can cut across national boundaries as well. We hope the Dutch presence at VIV Asia will bring together all the parties who must play a role in the transition to circular and sustainable agriculture. From hi-tech to hi-touch “Being in Bangkok is an excellent opportunity to also tell the story of more sustainable and innovative poultry production to early adapters in Asia”, Noud Janssen continues. “It fully fits in the vision of VIV: being a platform from feed to food for the entire animal production business. Last year at VIV Europe in The Netherlands, we have also had the opportunity to show and tell about all new initiatives to the international audience of this tradeshow. There’s a market for meat from pigs with long tails. That is possible, but proper herd management is essential: keeping the animals in good condition all the time and provide a good environment for them. Johan Schuttert explains. “We strongly focus on animal welfare and health”, says Johan Schuttert. “Pigs who are doing well, will automatically perform well”. Johan represents pig trading company Schuttert, a fourth generation family owned business in The Netherlands, with their own breeding and growing farms. Also they are contracting with pig growers across the country. These farms however, must comply with the demands of Schuttert, in terms of health and welfare. Such as pigs keeping their full tails. “We believe that pigs with their long, non-clipped tails are doing much better, than pigs with treated tails. It is part of our vision of providing a better life for pigs. That is not just limited to tails, but to the entire management. Of course, that demands much time and attention of the herd manager. But the reward will be healthier pigs. Pigs with full tails, kept together in one pen, run a bigger risk on cannibalism and tail biting. We must permanently observe them and identify the perpetrator once fighting may have started. But try to avoid that. We are feeding GMP+ (Good Manufacturing Practice) liquid feed with a high fiber content to our pigs. That will prevent competition during feeding. Also we provide “toys” in the pens, such as cotton bags and chains to distract them. Moreover we distribute sundried alfalfa in the pens, which is also distracting them and is good for their health and behavior. These are all choices, made by conviction. Keeping pigs with long tails is only possible if these are healthy, receive adequate distraction and kept under excellent herd management conditions. harvest. And the straw from the wheat crop is used as litter in the house. After finishing a broiler crop, it is used as fertilizer on our farm.” Johan: “I wanted to create a new concept in broiler chickens, something completely different to normal. I wanted to trigger people in such a way that they were tempted to buy the new Oranjehoen product. This was my true belief, as I felt the need to continuously improve the current way of raising broilers. As a bonus, the chickens tend to go orange with their distinctive orange feet. This is caused by feeding them carrots, curcuma and red beet. The Oranjehoen is a multicolored bird, with fattier breast - and thigh meat. It is healthier and sustainable for the future. The chicken looks and tastes differently. “The Netherlands is well-known around the world for its level of knowledge and innovation in agriculture”, Albert says. “But the consumer in general has no clue about that and where our daily food is coming from. That’s why I strongly believe in the concept of our floating farm, in which we are going to keep 40 dairy cows. Here, the consumer can see what we are doing and they can buy fresh dairy products, directly from our farm. That’s what motivates me: showing that farmers are even able to produce milk and dairy products in the heart of a city. And even in a sustainable way. We will use as many byproducts as possible for feeding the cows, like from nearby located beer manufacturing and potato processing plants. Fresh dairy produced in the heart of a city The floating farm has been designed for 40 cows, but thanks to its modular concept it can easily be scaled up to a bigger size. It is currently under construction and will be in full operation in the course of this year. Robert Nijkamp is a broiler farmer. But not a regular one. His “Windstreek” house is of a very special and unusual design. Completely energy neutral and naturally ventilated. With the help of smart computer software of course. Meat from this house is sold under his own label. Currently, Nijkamp has growing capacity for 70,000 birds. He is keeping slow growing Hubbard broilers, according to the “one star better life label” in The Netherlands. “We strongly believe in innovation and want to respond and switch to producing in a new and sustainable way”, says Robert. “Do something that others don’t. So apart from two existing houses, we also designed and built our innovative “Windstreek” (wind direction) house for 26,000 birds. We sell the meat from this house, under our own Windstreek label. Together with vegetables it is packed in a jar. We offer various recipes, representing wind directions: Mexico, Malaysia, France, Morocco. BITEZ: A FAIRER FOOD-SERVICE PLATFORM In order to combat the dependency on intermediary parties and increase direct value and accountability between core businesses and consumers in the foodservice industry, we are introducing the BITEZ Ecosystem. A decentralized food delivery ecosystem that significantly reduces business commission fees and enables direct online interaction between consumers, vendors and producers. BITEZ is an ecosystem where food consumption can easily be organized by the modern-day consumer, with a high level of transparency, trusted information, and peer-assessed quality. We offer an all-in-one foodservice solution where the skewed power dynamic will be restored. PROFIT FROM HEALTH: LET’S MAKE MONEY IN LIVESTOCK WITH PLEXUS! The worldwide growing demand food is an enormous challenge. With healthy livestock you can turn this challenge into more profit. Healthy animals require less antibiotics. At the same time they perform better with less effort. For your business this means increase of revenue by selling meat at a higher price. Monitoring is an essential step towards better animal health. Successful animal health monitoring requires data. With the software tool “Plexus” you can register all your animal health data in one place. The system shows trends and correlations. It provides insight in animal health status and effectiveness of vaccinations. Plexus gives you advice on how to reach better animal health and reduce the use of antibiotics. With Plexus and GD Animal Health more profit from healthy livestock is within reach. HOW WE CREATE ADDED VALUE TOGETHER SOMMEN Is inventor of a smart operating platform for the real-time management of production processes in modern agricultural companies. SOMMEN systems are used for durable poultry-housing concepts, incubators and data-sharing. 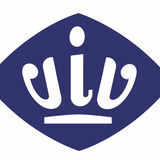 We develop systems based on your specific input and work together with renowned universities and strategic partners. The operating systems are web-based, allowing easy worldwide access via a smart phone or tablet, wherever you are. Our systems continually evolve and adapt in response to the changing needs. We keep your system up-to-date any time and provide worldwide remote support. That is how we create added value together! PUTTING A NUMBER ON SUSTAINABILITY Agriculture consultant in the field of precision livestock farming, working with leading agritech companies. â&#x20AC;&#x2DC;As an advocate for a future world of Digital animal farming, I continue to search new approaches, namely how to address the challenge that Information technology brings to farmers. My belief, weâ&#x20AC;&#x2122;ll see an evolution to a two tiered approach, where traditional farming meets centralized data analysis and farm optimization. I continue to evangelize this approach as a way, to not only drive more value from farm investment, but also resolve some of the broader challenges the supply chain faces. As we continue to intensify, we should try to do it in the most responsible way possible.